The Wedding Must Go On! Mu-Barack Obama to the Rescue! Leaders? They Don't Need No Stinkin' Leaders! UK's Guardian: Mubarak Family Fortune $70 Billion? In the article on February 4, 2011, UK's Guardian speculates that Mubarak Family has stashed away as much as $70 billions of wealth in UK (Bank of Scotland) and Swiss banks (UBS) as well as in properties in the UK and the US. Don't be mad, as the article tries to calm us, it is just a typical number for a typical Middle East ruler. So, Mubarak's wealth is 32% of GDP. Mubarak's wealth is $870 for every Egyptian. Congratulations. Wish you many happy years together. That company is Narus, a wholly owned subsidiary of Boeing as of 2010, located in Sunnyvale, California. The company's clients include Telecom Egypt, Saudi Telecom, and Pakistani Telecom, Korea Telecom, KDDI (Japan), and "many more", according to the company's web page. In contrast to courageous Egyptians who finally said enough is enough, here in the US we are expected to rat on the fellow spectators and meekly submit to pat-downs at the Super Bowl 2011, which is tomorrow at Cowboys Stadium in Dallas, Texas under frigid, wintry sky. As part of the increased security surrounding the Super Bowl, NFL and federal authorities are limiting what fans can bring to Cowboys Stadium. Everyone entering the stadium must pass through a magnatometer, such as those used at airports, and get a patdown as part of the screening process. The majority of fans will enter through checkpoints on the east side of Cowboys Stadium. Small bags are allowed, but will be searched, and jackets will be X-rayed. This is such a free country. More on Frank Wisner, Obama's Envoy to Egypt: "Ideal Time for Mubarak to Show the Way Forward"
We need to get a national consensus around the pre-conditions for the next step forward. The president must stay in office to steer those changes. The president must stay in office in order to steer those changes through. I therefore believe that President Mubarak's continued leadership is critical, it's his opportunity to write his own legacy. He's given 60 years of his life to the service of his country. This is an ideal moment for him to show the way forward. Incredible in a true sense of the word. Go see for yourself at BBC. or so this Youtube video claims. Caption on the vid: Egyptians lived like this for the past 30 years. It plaintively asks: Till when are you going to support this criminal regime? By all indications from the so-called Western leaders, like, forever? Some sort of an end plan must be getting into place when George Soros starts to squawk. Revolutions usually start with enthusiasm and end in tears. In the case of the Middle East, the tears could be avoided if President Obama stands firmly by the values that got him elected. Although American power and influence in the world have declined, our allies and their armies look to us for direction. These armies are strong enough to maintain law and order as long as they stay out of politics; thus the revolutions can remain peaceful. That is what the United States should insist on while encouraging corrupt and repressive rulers who are no longer tolerated by their people to step aside and allow new leaders to be elected in free and fair elections. Egypt is more complex and, ultimately, more influential, which is why it is so important to get it right. The protesters are very diverse, including highly educated and common people, young and old, well-to-do and desperately poor. While the slogans and crowds in Tahrir Square are not advancing a theocratic agenda at all, the best-organized political opposition that managed to survive in that country's repressive environment is the Muslim Brotherhood. In free elections, the Brotherhood is bound to emerge as a major political force, though it is far from assured of a majority. The main stumbling block is Israel. In reality, Israel has as much to gain from the spread of democracy in the Middle East as the United States has. But Israel is unlikely to recognize its own best interests because the change is too sudden and carries too many risks. And some U.S. supporters of Israel are more rigid and ideological than Israelis themselves. Fortunately, Obama is not beholden to the religious right, which has carried on a veritable vendetta against him. The American Israel Public Affairs Committee is no longer monolithic or the sole representative of the Jewish community. The main danger is that the Obama administration will not adjust its policies quickly enough to the suddenly changed reality. I am, as a general rule, wary of revolutions. But in the case of Egypt, I see a good chance of success. As a committed advocate of democracy and open society, I cannot help but share in the enthusiasm that is sweeping across the Middle East. I hope President Obama will expeditiously support the people of Egypt. My foundations are prepared to contribute what they can. In practice, that means establishing resource centers for supporting the rule of law, constitutional reform, fighting corruption and strengthening democratic institutions in those countries that request help in establishing them, while staying out of those countries where such efforts are not welcome. Egyptians, I'd suggest you say "Thank you but no thank you." Who Is Frank G. Wisner, Obama's Special Envoy to Egypt? No matter what the light-weight, empty-suit occupant of the White House says about the situation in Egypt - "Mubarak has to go, now", it is always the action that reveals his (in this case, his handlers') intention. And that action was to appoint Frank G. Wisner II as the Special Envoy to Egypt on January 31, 2011. And who is Frank G. Wisner II, who's described as "respected elder of the foreign establishment" by New York Times? Well, New York Times leaves out some important details. His most recent work was not in the diplomatic circle. It was AIG. Remember the company that was bailed out by the US taxpayers so that it could distribute the money to TBTF Wall Street banks (most notably Goldman Sachs) and European banks and other multinational conglomerates? He was the Vice Chairman of AIG until he retired from the post in February 2009 after the bailout was secure. And before AIG? Oh my he was at Enron! He joined the board of an Enron subsidiary (Enron Oil & Gas Company) in 1997, after several years of diplomatic service in the Philippines (1991-1992) and India (1994-1997) during which he tirelessly helped Enron win lucrative contracts. Oh wait, he is still a board member at this Enron subsidiary, who has changed the name to EOG Resources. He is the son of Frank G. Wisner, master spook who was the head of the OSS. 8:07pm Hosni Mubarak must stay in power for the time being, says Frank Wisner, Barack Obama's special envoy for Egypt. So Obama sends out a diplomat/businessman who exploited the public (diplomatic) position fully to enrich a very corrupt (criminal) private company after another, who has personal ties to the Egyptian dictator whom the protesters want out (the whole point of this 2-week long protest), as the Special Envoy. Remember the group of hackers, who attacked the servers of the companies seen as following the US government's strong guidance to deny service to WikiLeaks, back in November and December last year? They are back, this time to "support" the Egyptian Revolution. They started attacking the Egyptian government sites as soon as the Internet was restored in Egypt on Wednesday. NEW YORK — Hacker activists started attacking Egyptian government websites on Wednesday, apparently taking them offline soon after the country restored Internet service. An Internet forum run by a loose international group that calls itself "Anonymous" directed participants to attack the websites of the Egyptian Ministry of Information and the ruling National Democratic Party. Neither was accessible from New York on Wednesday afternoon. In a Twitter post, the group claimed credit for taking down the ministry's website and said the group was motivated by a desire to support Egyptian protesters. The same group rallied to support WikiLeaks in November and December, attacking websites of companies it saw as hampering the document-distribution site. 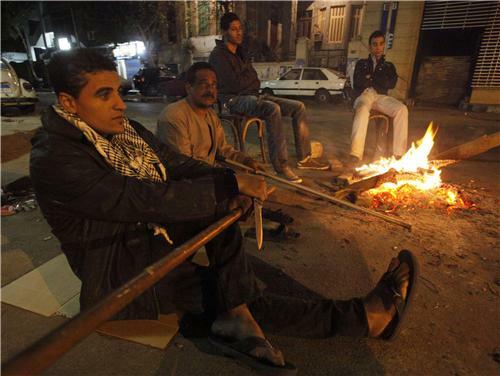 The Egyptian government cut off all Internet service in the country on Friday, then restored it early Wednesday. One member of Anonymous, speaking on condition of anonymity because of the possibly illegal nature of its activities, said the number of participants in the attacks was much lower than it was in December. Thousands of young people then joined in attacks on such sites as MasterCard.com and Visa.com – in those cases because the payment processors declined to transfer money to WikiLeaks. But because the Egyptian government websites are much easier to take down, the lower number of participants is still adequate, the member said. The member said the weapon of choice for the hackers is the same as in December: a small program called Low Orbit Ion Cannon. It sends out a flood of fake traffic to a selected website, swamping it if it doesn't have enough capacity. Ayatollah Ali Khamenei, Iran's supreme leader has called the uprisings in Egypt and Tunisia an "Islamic liberation movement". In his address, during Friday prayers at Tehran University in Iran's capital, he said that people are witnessing the reverberations of Iran's 1979 Islamic revolution. "The awakening of the Islamic Egyptian people is an Islamic liberation movement and I, in the name of the Iranian government, salute the Egyptian people and the Tunisian people,"he said. Khamenei has urged Egypt's protesters to follow in the footsteps of the Iranian revolution which toppled a pro-US leader and installed an Islamic Republic, calling on Egyptians to unite around religion. He said events in Tunisia and Egypt, were a sign of "Islamic awareness" in the region and that these movements will spell an "irreparable defeat" for the United States. It is "us against them" for Egyptians, for sure, but "them" includes not only corrupt politicians but also people with religious fanaticism and intolerance - like you. These people are rising against the ruling class. Egypt had the largest anti-Mubarak, pro-democracy demonstrations throughout the country on Friday. Alexandria had 1 million, peacefully marching and gathering. 9:51pm Wael Abbas, a pro-democracy activist and blogger, tells Al Jazeera that the protesters have no need for leadership. He is outside Liberation Square (Tahrir). There is no need for leadership, people are organising themselves. People already know what there demands are, they don't need someone to tell them what to do. Will the US and its allies succeed in forcing these people to accept new "leaders" picked by the US? CNBC's parent company, NBC Universal, by the way, is now 51% owned by Comcast while 49% is still owned by GE. GE's CEO is now Obama's Job Czar. Care to know the job number? Remember, the consensus was 146,000 jobs, with some so-called economists saying the number might be much higher. It conflicts with a business payroll survey last month that showed relatively weak job growth. But that survey doesn't count the self-employed and likely undercounts the nation's smallest businesses. Also, harsh weather disrupted business payrolls in January. By the way, the more frigid Canada created 69,200 jobs in January, 4 times as many as forecasts, while their unemployment rose because more people started looking. Which would we rather have? Clearly CNBC panelists have us believe a lower unemployment number is good for us. But as I said, it doesn't matter to the permanently levitating stock market. Dow's up, so is Nasdaq and S&P500. Not by much, but who cares? The anti-government demonstration is set to resume with renewed vigor on Friday. 8:59am: Mohammed al-Beltagi, a leading member of the Muslim Brotherhood, tells Al Jazeera that his movement has no ambitions to run for the Egyptian presidency. 8:29am: Our correspondent writes on Twitter: "by 7am friday: chants of 'get out' 'invalid' 'leave' resonating louder than ever this time of day"
8:21am: Salma El Tarzi, a protester in Tahrir Square, tells Al Jazeera over the phone that the moral in the square is high and the atmosphere cheerful, "like a festival", with thousands of people arriving. 8:01am: The curfew has now been lifted and protests are due to start at noon, after Friday prayers. 2:08am Anti-Mubarak activist Mona Souief tells Al Jazeera that people feel that they are "past the worst." and that if protesters could make it past the violence of the past 24 hours, than they could persevere. They will use the job number for January to ramp up the market anyway, whether it is good or bad. If the number is good, they will ramp up the market because, really, the economy is growing rapidly! If the number is bad, they will ramp it up because Ben and the Inkjets at the Fed will surely embark on QE3 to further benefit Primary Dealers. Since PDs are the market and the market is the economy, why we will have an economic miracle this year! WASHINGTON (AP) -- Economic growth is gaining momentum, with factories busy and service firms expanding, but one critical area still lags: job creation. The Labor Department will issue its January jobs report Friday, and economists are forecasting that it will show only modest hiring. Employers are expected to add a net total of 146,000 new jobs. That's barely enough to keep up with population growth. The unemployment rate is likely to tick up to 9.5 percent from 9.4 percent in December. Some analysts are more optimistic and think the job gains could be larger, after several positive economic reports were released Thursday. The service sector, which employs nearly 90 percent of the work force, expanded at the fastest pace in five years last month, retail sales increased, and factory orders grew in December. "Activity across the broader economy is picking up," said Neil Dutta, an economist at Bank of America Merrill Lynch. "Momentum is improving." Whatever. It doesn't matter any more. Have you noticed that the stock market does not respond to the FOMC announcements like it used to do? These days, the FOMC is a non-event. Job numbers are non-events. GDP numbers are non-events. Behind all these numbers is Ben Bernank printing merrily on high. Ben has long broken the market. Obumbum is scrambling to replace "One Crony Egyptian Government with Another" before the Super Bowl Sunday with Jennifer Lopez. The Obama administration is discussing with Egyptian officials a proposal for President Hosni Mubarak to resign immediately, turning over power to a transitional government headed by Vice President Omar Suleiman with the support of the Egyptian military, administration officials and Arab diplomats said Thursday. In other words, the formerly biggest spook of the Middle East, and quite possibly a former CIA asset, is about to become president, under the auspices of a US-endorsed "democratic" transition, which does nothing but replace one crony regime with another. The proposal also calls for the transitional government to invite members from a broad range of opposition groups, including the banned Muslim Brotherhood, to begin work to open up the country’s electoral system in an effort to bring about free and fair elections in September, the officials said. It is disturbing that the US administration does not comprehend that the Egyptian people (not to single out the MB) are sufficiently intelligent to see just how superficial this proposed "regime change" is. The only thing remaining is for George Soros to be propounding the benefits of "Open Society" on the streets of Cairo within weeks. Muslim Brotherhood, for one, even though they didn't bother showing up in the protest until Tuesday, and other fundamentalist Islamicists who amply demonstrated (I hope) to secular Egyptians in Tahrir Square how fanatically brutal they were (in reference to Robert Fisk's report I quoted in my post). Well-placed Israeli sources have disclosed that the Zionist state has offered to place "all its capabilities" at the disposal of General Omar Suleiman, the recently appointed Vice President of Egypt, for the "protection of the regime in Egypt". This offer includes the implementation of "various operations to end the popular revolution". Israel has also asked Suleiman to work on preventing arms being smuggled into the Gaza Strip. An official in Benjamin Netanyahu's office said that the Israeli Prime Minister Netanyahu called Suleiman, who is also the director of Egypt's General Intelligence Service, and expressed his concern about the situation in Egypt. Netanyahu apparently suggested the possibility of Israeli intelligence personnel undertaking various specialist operations to bring an end to the demonstrations. The source added that Netanyahu and Suleiman also discussed ways of securing the border between Israel and Egypt. Several weeks ago, following terrorist attacks on worshipers at Coptic Christian services, hundreds — perhaps thousands — of Egyptian Muslims volunteered their services as “human shields” as their Christian neighbors celebrated the birth of Christ. In recent days, Egyptian Christians protesting in the streets of Cairo have joined hands to create a protective barricade for their Muslim neighbors, shielding them from State-inflicted terrorist violence during prayers. This is exactly what the cynical, bloody-minded people engineering a “clash of civilizations” want to prevent. 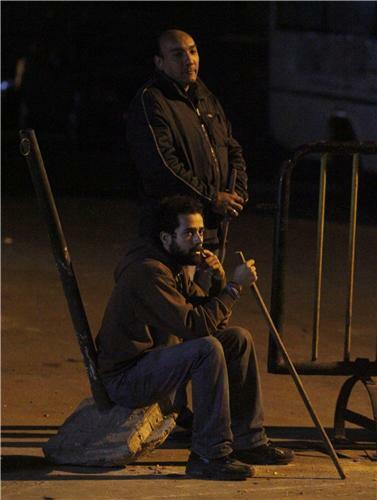 On a lighter note, UK's Guardian has pictures of make-shift "helmets" worn by the anti-Mubarak protesters. Asmaa Mahfouz, 26-year-old Muslim woman, recorded the vid on January 18 and posted on her Facebook page, calling for a march to Tahrir Square on January 25. The rest is history. with her husband, of course. Mubarak Is "Not a Dictator", Is a "Monarch-Type", and now Is "Our Father"
8:13pm Suleiman: Mubarak is our father - Vice-president says those calling for President Mubarak to leave are not part of Egypt's culture. Well, it is now, Mr. Suleiman. Is it part of Egypt's culture to unleash your thugs into peaceful demonstrators? I guess it is. His name, Suleiman, means "man of peace" in Arabic. The English equivalent is Solomon. Mubarak has a sense of humor, for sure. or Child Terrorists Threaten Middle-East Peace, as Fox News would have it. Near the statue of Talaat Harb, a boy sold agwa – a peculiarly Egyptian date-bread delicacy – at 4 pence each – while on the other side of the road, two figures stood, a girl and a boy, holding identical cardboard trays in front of them. The girl's tray was filled with cigarette packets. The boy's tray was filled with stones. A free market capitalism is alive and well, amid chaos and violence. Below is the intraday chart of GLD, a gold ETF about 1/10 of the price of physical gold. WTF happened?? Or is it just the money from today's POMO? but there will be no limit on transfers, overseas included. Big businesses, rich Egyptians need not worry (if they are ever worried). ECB has $36 billion reserves. Individuals will be limited to daily withdrawals of 50,000 Egyptian pounds ($8,537) and $10,000 worth of foreign currency. No such limit for companies. Unlimited transfer of funds for anyone. The central bank's deputy governor is confident that there will be no problem honoring all transactions, and there will be no weakening of the currency. For more, go to Reuters' article. with stones and sticks, against Mubarak "supporters" (aka paid thugs) in Tahrir Square, with women and children in the center, "young women in scarves and long skirts on their knees, breaking up the paving stones as rocks fell around them" as Robert Fisk saw them. If this is not an inspiration, I don't know what is. "President" Hosni Mubarak's counter-revolution smashed into his opponents yesterday in a barrage of stones, cudgels, iron bars and clubs, an all-day battle in the very centre of the capital he claims to rule between tens of thousands of young men, both – and here lies the most dangerous of all weapons – brandishing in each other's faces the banner of Egypt. It was vicious and ruthless and bloody and well planned, a final vindication of all Mubarak's critics and a shameful indictment of the Obamas and Clintons who failed to denounce this faithful ally of America and Israel. The fighting around me in the square called Tahrir was so terrible that we could smell the blood. The men and women who are demanding the end of Mubarak's 30-year dictatorship – and I saw young women in scarves and long skirts on their knees, breaking up the paving stones as rocks fell around them – fought back with an immense courage which later turned into a kind of terrible cruelty. Al Jazeera reports 5 dead, more than 800 injured. And an increasing number were wearing Islamist dress, short trousers, grey cloaks, long beards, white head caps. They shouted Allahu Akbar loudest and they bellowed their love of God, which was not supposed to be what this was all about. Yes, Mubarak had done it. He had brought the Salafists out against him, alongside his political enemies. ...Many of the protesters – secular young men, pushing their way through the attackers – tried to defend the prisoners. Others – and I noticed an awful lot of "Islamists" among them, complete with obligatory beards – would bang their fists on these poor men's heads, using big rings on their fingers to cut open their skin so that blood ran down their faces. One youth, red T-shirt torn open, face bloated with pain, was rescued by two massive men, one of whom put the now half-naked prisoner over his shoulder and pushed his way through the crowd. Who are the Salafists? They are radical, Muslim fundamentalists. The last paragraph quoted above gives me despair and hope. Despair, because of these "Islamists" who would think nothing of cutting open their captured opponents' skin with their religious rings. Getting rid of Mubarak and his men only to be dominated by the cruel people like them? But then hope, because of the anti-Mubarak secular protesters rescuing the prisoner from the cruel treatment by these religious fanatics. I am not into any religion, but if I knew how to pray I would pray for these courageous, secular, anti-Mubarak Egyptians so that they prevail. GOP Leading Candidate for 2012 Mitt Romney Calls Mubarak a "Monarch-Type Figure"
On CNN tonight, Mitt Romney called Egyptian president Hosni Mubarak a "monarch-type figure", but not a dictator. "He is the leader of his country. He is a monarch-type figure. I probably would avoid the term 'dictator', but what I would say is that the country has not had the kind of representation from its people. They've not had the kind of economic freedom, of political freedom which they aspire to." Joe Biden recently took heat for claiming that Mubarak is not a dictator. The Hill's link has the video clip. He is definitely, absolutely, not getting my vote. Mubarak's thugs ("supporters") are paid $17 a day. Camels and horses they rode into the peaceful anti-Mubarak protesters were rented from the tour agencies I hear, and they clearly have a truckload supply of Molotov cocktails to throw at men, women, and children in the square. 4 out of 10 Egyptians were earning less than $2 a day last year. Anti-Mubarak protesters are pushing back. The Army is standing by, doing nothing to protect the protesters except when they hear gun fires. After all, Mubarak has been their benefactor, securing billions of dollars of US military aid. You can hear heavy gun fires in Al Jazeera's live feed. Gibbs repeatedly reinforced what Obama had said the night before: a transition to a new government, without Mubarak as its head, must begin now. "Now means now," Gibbs said, as live images of firebombs raining from rooftops and ambulances screaming across Cairo were broadcast around the world. ... Before he spoke out on Tuesday evening, the president also had what Gibbs called a "direct and frank" but private — talk with Mubarak. Well, after that talk, Mubarak unleashed his thugs to create chaos. Good job, Barack. 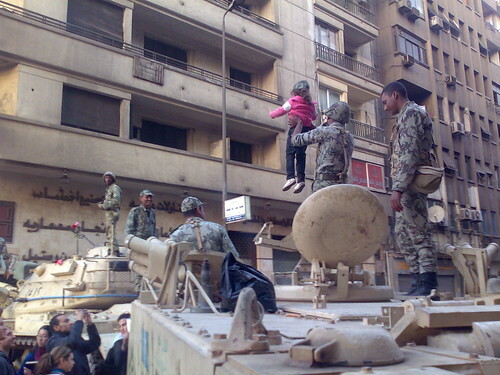 Now, who gave orders to Mubarak? Or is he a "lone nut"? I'll answer my own question in the last post, "What Is Mubarak Thinking?" He's doing what he's doing - openly attacking the anti-government protesters and creating chaos and bloodshed - to bring about a radical, fundamentalist Islamic regime in Egypt. A radical, fundamentalist Islamic organization may be the only force that could match violence with violence. The US and its allies in Middle East could then say "See how bad those fundamental Islam fanatics are? [Let's conveniently forget Saudi Arabia.] We've lost Egypt to these Islamic terrorists! [Let's also forget that Egypt was not technically our colony that we owned.] We need to keep spending on "war on terror", and we have to be vigilant all over the world!" The military-industrial complex must be fed. In order to justify the feeding, it needs an enemy. Where there's none, it has to create one. Peaceful protesters, with Christians and Muslims, with women and children among them, just don't cut it as their "enemy". So Mubarak sets out to turn the peaceful uprising into a bloody one, to give an opening to the radical fundamentalists to become a stereotypical "enemy of the free world". Mubarak must know his political life in Egypt is over. How then can he secure a good after-life? By doing what the military-industrial complex wants and creating a new enemy for the complex. In return, Mubarak will be rewarded with a comfortable exile somewhere in the West (or in Israel), hailed as a hero, albeit failed, who tried to defend his country against radical Islam. Everyone will be happy. The majority of Congressional Republicans will be more than happy to continue the war on terror and keep the military spending up. So will the Neocons who have been steadily hijacking the tea party movement. Dems? They've been trigger-happy ever since their man, Barry, became the president. Everyone will be happy, except for the great majority of Egyptians. He had his thugs fire-bomb the national museum. His thugs are fire-bombing the anti-Mubarak protesters and throwing bricks from above onto women and children, after blocking the exits from Tahrir Square. The Internet traffic is back into Egypt. People around the world are watching and reading and listening, and know who's doing what. Does he think that sending his thugs to kill and injure the protesters and having it reported outside Egypt somehow enhances his standing? Suppose it IS enhancing his standing. Among whom? Ah that's the question. He could care less about his standing among Egyptians, which at this point is nil, null, zero, ling (except among his thugs). But Mubarak had better recall how the Romanian leader and his wife ended up. Or, going back further, how Louis Capet and 'Toinette ended up. 6:12pm Al Jazeera reporting that the Egyptian museum was fire bombed and the army is now trying to put out the fire. It must be the same museum that courageous citizens of Cairo protected from "looters" who turned out to be Mubarak's thugs. 6:50pm Egypt continues to rejected international calls for an immediate transfer of power, as pro- and anti-government supporters clash in the streets of Cairo. In addition to organising louder and bolder rallies in favor of Mubarak, pro-government demonstrators are seen dropping stones and firebombs from buildings onto people below. Barack, where are you? So well above your pay-grade, isn't it? You'd better keep the Connecticut National Guard out of this, at least. Anderson Cooper was attacked in Egypt Wednesday. CNN producer Steve Brusk Tweeted, "Anderson said he was punched 10 times in the head as pro-Mubarak mob surrounded him and his crew trying to cover demonstration." Cooper then escaped to the roof of a nearby building, where he said on air that he and his crew were trying to get to a neutral zone between protestors and pro-Mubarak supporters when they "were set upon by pro-Mubarak supporters punching us in the head. The crowd kept growing, kept throwing punches, kicks...suddenly a young man would look at you and punch you in the face." Mubarak gives the protesters a choice between him and chaos, and immediately unleashes chaos by unleashing his thugs on the street, counting on the Western media including alternative media site like Drudge to report it as if his thugs and the protesters were one and the same, violent, lawless Muslims. And only he and his minions in his government can bring order and stability! Mubarak's announcement that he would not seek re-election in September and his unleashing of his thugs into the protesters followed the telephone conversations with Barack Obama, the president of the US. Gutlessness of the West, particularly of Washington, is what Robert Fisk said in his yesterday's essay. I cannot agree more, and "gutlessness" is too soft a word. Looking at what's been happening since the announcement, the West, particularly Washington, is Mubarak's co-conspirator. Like many people we’ve been glued to the news unfolding in Egypt and thinking of what we could do to help people on the ground. Over the weekend we came up with the idea of a speak-to-tweet service—the ability for anyone to tweet using just a voice connection. We worked with a small team of engineers from Twitter, Google and SayNow, a company we acquired last week, to make this idea a reality. It’s already live and anyone can tweet by simply leaving a voicemail on one of these international phone numbers (+16504194196 or +390662207294 or +97316199855) and the service will instantly tweet the message using the hashtag #egypt. No Internet connection is required. People can listen to the messages by dialing the same phone numbers or going to twitter.com/speak2tweet. We hope that this will go some way to helping people in Egypt stay connected at this very difficult time. Our thoughts are with everyone there. Update Feb 1, 12:47 PM: When possible, we're now detecting the approximate (country-level) geographic origin of each call dialing one of our speak2tweet numbers and attaching a hashtag for that country to each tweet. For example, if a call comes from Switzerland, you'll see #switzerland in the tweet, and if one comes from Egypt you'll see #egypt. For calls when we can't detect the location, we default to an #egypt hashtag. However, I'm starting to believe that Egyptians have come together precisely because the government shut down the Internet. The government shut down much of mobile phone network, though that has come back on. No tweet, no facebook, no cellphone, and people actually started to talk with their neighbors. No proof on this, just my personal take. Robert Fisk: "Secular and devout. Rich and poor. They marched together with one goal"
"It was a victory parade – without the victory." It was a victory parade – without the victory. They came in their hundreds of thousands, joyful, singing, praying, a great packed mass of Egypt, suburb by suburb, village by village, waiting patiently to pass through the "people's security" checkpoints, draped in the Egyptian flag of red, white and black, its governess eagle a bright gold in the sunlight. Were there a million? Perhaps. Across the country there certainly were. It was, we all agreed, the largest political demonstration in the history of Egypt, the latest heave to rid this country of its least-loved dictator. Its only flaw was that by dusk – and who knew what the night would bring – Hosni Mubarak was still calling himself "President" of Egypt. There were several elements about this unprecedented political event that stood out. First was the secularism of the whole affair. Women in chadors and niqabs and scarves walked happily beside girls with long hair flowing over their shoulders, students next to imams and men with beards that would have made Bin Laden jealous. The poor in torn sandals and the rich in business suits, squeezed into this shouting mass, an amalgam of the real Egypt hitherto divided by class and regime-encouraged envy. They had done the impossible – or so they thought – and, in a way, they had already won their social revolution. And then there was the absence of the "Islamism" that haunts the darkest corners of the West, encouraged – as usual – by America and Israel. As my mobile phone vibrated again and again, it was the same old story. Every radio anchor, every announcer, every newsroom wanted to know if the Muslim Brotherhood was behind this epic demonstration. Would the Brotherhood take over Egypt? I told the truth. It was rubbish. Why, they might get only 20 per cent at an election, 145,000 members out of a population of 80 million. A crowd of English-speaking Egyptians crowded round me during one of the imperishable interviews and collapsed in laughter so loud that I had to bring the broadcast to an end. It made no difference, of course, when I explained on air that Israel's kindly and human Foreign Minister, Avigdor Lieberman – who once said that "Mubarak can go to hell" – might at last get his way, politically at least. The people were overwhelmed, giddy at the speed of events. So was I. There I was, back on the intersection behind the Egyptian Museum where only five days ago – it feels like five months – I choked on tear gas as Mubarak's police thugs, the baltigi, the drug addict ex-prisoner cops, were slipped through the lines of state security policemen to beat, bludgeon and smash the heads and faces of the unarmed demonstrators, who eventually threw them all out of Tahrir Square and made it the Egyptian uprising. Back then, we heard no Western support for these brave men and women. Nor did we hear it yesterday. So Fisk confirms what Egyptians were saying all along: It was Mubarak's thugs. ..Amazingly, there was little evidence of hostility towards America although, given the verbal antics of Barack Obama and Hillary Clinton these past eight days, there might have well been. One almost felt sorry for Obama. Had he rallied to the kind of democracy he preached here in Cairo six months after his investiture, had he called for the departure of this third-rate dictator a few days ago, the crowds would have been carrying US as well as Egyptian flags, and Washington would have done the impossible: it would have transformed the now familiar hatred of America (Afghanistan, Iraq, the "war on terror", etc) into the more benign relationship which the US enjoyed in the balmy 1920s and 1930s and, indeed, despite its support for the creation of Israel, into the warmth that existed between Arab and American into the 1960s. But no. All this was squandered in just seven days of weakness and cowardice in Washington – a gutlessness so at odds with the courage of the millions of Egyptians who tried to do what we in the West always demanded of them: to turn their dust-bowl dictatorships into democracies. They supported democracy. We supported "stability", "moderation", "restraint", "firm" leadership (Saddam Hussein-lite) soft "reform" and obedient Muslims. This failure of moral leadership in the West – under the false fear of "Islamisation" – may prove to be one of the greatest tragedies of the modern Middle East. Egypt is not anti-Western. It is not even particularly anti-Israeli, though this could change. But one of the blights of history will now involve a US president who held out his hand to the Islamic world and then clenched his fist when it fought a dictatorship and demanded democracy. Please go to the link and read this beautiful essay. Oh what an excellent timing, Mr. Assange. For some reason unknown to me, the leaks these days go to Telegraph, not Guardian. Al-Qaida is on the verge of producing radioactive weapons after sourcing nuclear material and recruiting rogue scientists to build "dirty" bombs, according to leaked diplomatic documents. A leading atomic regulator has privately warned that the world stands on the brink of a "nuclear 9/11". Security briefings suggest that jihadi groups are also close to producing "workable and efficient" biological and chemical weapons that could kill thousands if unleashed in attacks on the West. In order to justify staying in power until elections are held in September, President Mubarak said on tv that the people had to choose between him and "chaos". President Hosni Mubarak announced late Tuesday that he would not run for another term in office, but whether Egyptians would allow him to remain in office until elections in the fall was uncertain. In a 5-minunte pre-recorded televised address to Egypt that was translated into English, Mubarak said it had never been his intention to run for re-election in September. Mubarak said the protests that erupted Jan. 25 "force us to choose between stability and chaos." 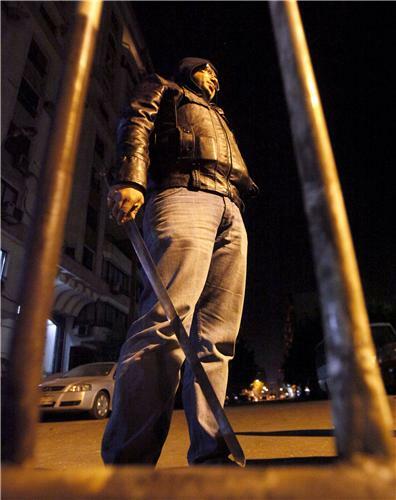 Soon after Mubarak's speech was broadcast, clashes broke out between pro- and anti-Mubarak forces in Alexandria. Reports on the ground say that the pro-Mubarak protesters tried to break into the peaceful protest to start a riot, chanting "We want Mubarak!". But the anti-Mubarak protesters did not take the bait. The army broke up the clash and ensured peace by firing a couple of shots into the air above everyone's head. Clashes between anti-government and pro-Mubarak protesters in Alexandria. Shots are fired in the air. Once again, thanks to President Mubarak for educating the world about agents provocateur and false flag shenanigans. Egyptians didn't bite. They are smarter than many of us here. By the way, even one of the MSM has started to report the truth - that those "looters and thugs" were Mubarak's men. The article by Washington Post even refers to a prison escape, which many in Egypt have said was done by the regime. Of all people at the Federal Reserve, the supposed monetary hawk Thomas Hoenig (Kansas Fed chief) indicates he and his colleagues are amenable to QE3. The Federal Reserve could debate extending its bond-buying program beyond June if U.S. economic data prove weaker than policymakers expect, Kansas City Fed President Thomas Hoenig said. Another round of bond buying "may get discussed" if the numbers look "disappointing," Hoenig told Market News International in an interview published on Tuesday. The eternal put is on the stock market. Have no fear. Everything and anything is already priced in. BTFD (Buy the Failed/F--king Dip). Hey WikiLeaks, What Happened to Bank of America Leak? It's February, and there was no leak about Bank of America that you promised in January. Maybe that's why the shares of Bank of America jumped today? No Internet? No mobile phone? No Twitter? No problem. They are the House, the Senate, and the President. A whole lot more pictures here. I hope she, and all these people who will take part in tomorrow's march, will be unharmed and safe, and go on to achieve what they want to achieve. In preparation by the Mubarak government (which happens to enjoy very strong support from Israel) for Tuesday's "Million Man March", no doubt. On Friday we reported that almost all Egyptian Internet connectivity had been cut off. Routes to the company's major ISPs had been dropped from global routing tables, leaving no way to send traffic to the country. At the time, one ISP, Noor Group, remained connected. Now even that connection has gone offline. As of a few hours ago, routes to the ISP started disappearing, and customer sites are now unavailable. These include the Egyptian Stock Exchange and I-Score, the country's credit rating bureau. Have been watching Al Jazeera English News and just heard that Egypt also shutdown it's public transit network of trains and buses. They are really going all out now in an attempt to limit the number of people at todays "Million Man March" as they are calling it. "To the great people of Egypt, your armed forces, acknowledging the legitimate rights of the people [stress that] they have not and will not use force against the Egyptian people," the military said in a statement. U.S. District Court Judge Roger Vinson on Monday dealt the strongest legal blow yet to ObamaCare, ruling that the individual mandate "exceeds" the authority of Congress and that the entire law should be "declared void." Another federal judge ruled in December that the mandate was unconstitutional. But Vinson went further, ruling that it was not severable from the rest of ObamaCare, so the entire act should be struck down. At least two other judges have ruled in favor of ObamaCare. The Supreme Court almost certainly will hear the issue eventually. The plaintiffs in the Florida suit included 26 state governments, giving the ruling added prominence. The mandate requires individuals to buy health insurance or pay a fine. The administration argued that the federal government can compel people to buy insurance via the Constitution's interstate commerce clause. Vinson ruled that the mandate tries to regulate economic inactivity, which he called the "very opposite of economic activity." In December, Judge Henry Hudson of eastern Virginia also ruled the mandate unconstitutional. Courts in Michigan and western Virginia had previously dismissed challenges to the mandate. The Supreme Court will likely offer a split decision. Historically, the high court has been loath to curtail the legislative branch's authority. But regulating economic inactivity is unprecedented. And, as the 26-state case showed, there is strong political and voter opposition to the year-old law. According to sources in the Egyptian Embassy in Tel Aviv, Israel is making preparations to welcome Hosni Mubarak into exile after Saudi Arabia rejected overtures. As Timmy, Ben, Goldman, or JP Morgan Chase (does it matter who?) tries the atmost best to keep the stock market up by bidding up AAPL (20% of Nasdaq) and IBM (almost 10% of Dow), the volatility index had an intraday flash crash. Did You Know That Connecticut National Guard Is In Egypt Right Now? to supposedly support the Multinational Force and Observers (MFO). They were deployed on January 15, one day after Tunisians routed out their dictator president out of the country. HARTFORD, Conn., - Maj. Gen. Thaddeus J. Martin, Adjutant General and Commander of the Connecticut National Guard, announces that Detachment 2, Company I, 185th Aviation Regiment of Groton, is mobilized and will deploy to the Sinai Peninsula, Egypt to support the Multinational Force and Observers (MFO). This unit operates C-23C Sherpa aircraft and has deployed three separate times in the last seven years in support of Operation Iraqi Freedom and Operation Enduring Freedom. The unit departed Connecticut earlier today for Ft. Benning, GA, for further training and validation. This aviation unit is commanded by Chief Warrant Officer Four James Smith of Ivoryton, Conn.
Photo taken by Ramy Raoof. 3:00 PM EST (9:00 PM Cairo) OBAMA MUST SUPPORT MUBARAK says the Zionist Organization of America, according to an email I just received from a PR firm. The email summarizes the position of Morton Klein, the group's national president, thusly: "The United States must do everything possible to keep Mubarak in power even though he is a dictator – otherwise we risk someone even more radical and extremist taking over. Whoever were to take over would surely be an enemy to both the United States and Israel. Should a group like the Muslim Brotherhood take power, any chance of the peace treaty with Israel and Egypt will surely die." It's a predictable point of view that, of course, amounts to asking the US to defy the will of the Egyptian people. There is been almost no discussion or interest in Israel in a public way from the tens of thousands of Egypt protesters who have taken to the streets this week. Average Egyptian's, like almost all Arabs, have a low opinion of Israel if prompted, but they're focused on reordering their internal affairs. Their complaints focus on low wages, state torture, lack of freedom and so on. Could the Muslim Brotherhood come to power some day? Well, maybe, though that's far from certain and many analysts I respect speculate the group's popularity would fade in an environment were real political movements and parties were tolerated. But even if they rose to parliamentary power, it's hard to see renewing confrontation with Israel -- a drain on resources and a distraction from the demands of the Egyptian people -- would be a first order of business. Statements like this will, of course, feed conspiracy theories that the US and Israel stood in the way of democracy in Egypt if Mubarak manges somehow to hang on. Not all Jews are Zionists. Far from it. to clobber the yet-to-materialize angry citizens.. The article at Zero Hedge. Egyptians need a leader who is responsive to their aspirations. Even Al Jazeera seems to have joined the chorus of looking for a leader for this Egyptian revolution which has been, so far, leader-less. But look at these proud, ancient people, defending their families, neighborhoods, cities, from government thugs. Do they look like they need a leader to tell them what to do and what to think? The other spin is well and alive, that the dangerous radical Islamism is spreading. Uh huh. Muslim Brotherhood has been all but absent. Radical, Muslim looters turned out to be in the government employ. Neighborhood watch is done by Muslim and Christian neighbors. Again, do you think these people you see in these pictures want to subjugate themselves to another tyranny, after getting rid of (I hope very soon) one tyranny? Do they look scared? Do you think anyone want to mess with them? Freedom, self-determination, self-organization. That's what's spreading. A very dangerous idea indeed, for the ruling class. Thus this rush to find them a "leader". And again, this picture from AFP: men defending the national museum that houses artifacts and treasures of their 5000-year history.